Last week when it started to get warm, I dispersed my 2011 orts on the bushes around my house. I always hope the birds will use them for building their nests. I do have a finish to announce! 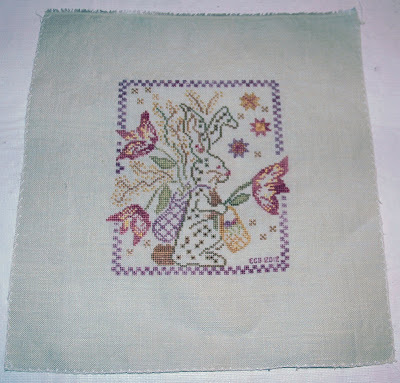 Easter Parade by Blackbird Designs - Stitched on 32ct Waterlily with GA Threads. I loved stitching this one! Now I have to find the right frame. I have an attic full of frames and yet none of them seem right. This is an odd size. It will be tough to find one. 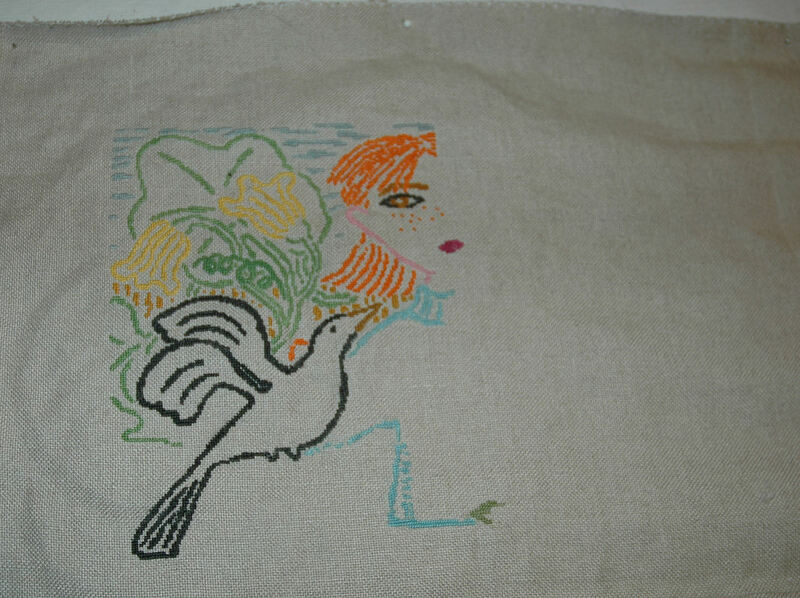 I would like to stitch it again on 40ct to have it a little smaller. I made a little progress on L'Automne. This is very slow going one over one. It is frustrating because I made a critical error somewhere early on. I thought I found it and fixed it, but no such luck. Don't you just hate it when the lines don't meet up! It is especially important in this as it is a line drawing! I have been improvising as I go along but I am afraid there is something unfixable looming out there! Not a good feeling. Hope everyone enjoys the day out there! It is beautiful here in New York. Hope it is nice where you are. Love Love Love Easter Parade! It's one of my all time favorite things I've ever stitched! Your Easter Parade is so pretty! Bummer about the mistake on L'Automne. I hope it doesn't affect the design for you. It's pretty so far! Love your Easter Parade! Hope that you can get round the error by some creative fudging. It's so disheartening when you find out something's gone a bit off somewhere. Your BBD finish is lovely. Hope you can put your error right on L'autumne. Lovely idea putting your old orts out for the birds. Out ogling ORTs. Yours are so pretty and you are so kind to share your old ones with our feathered friends! I love Easter Parade, congratulations on finishing it so quickly. 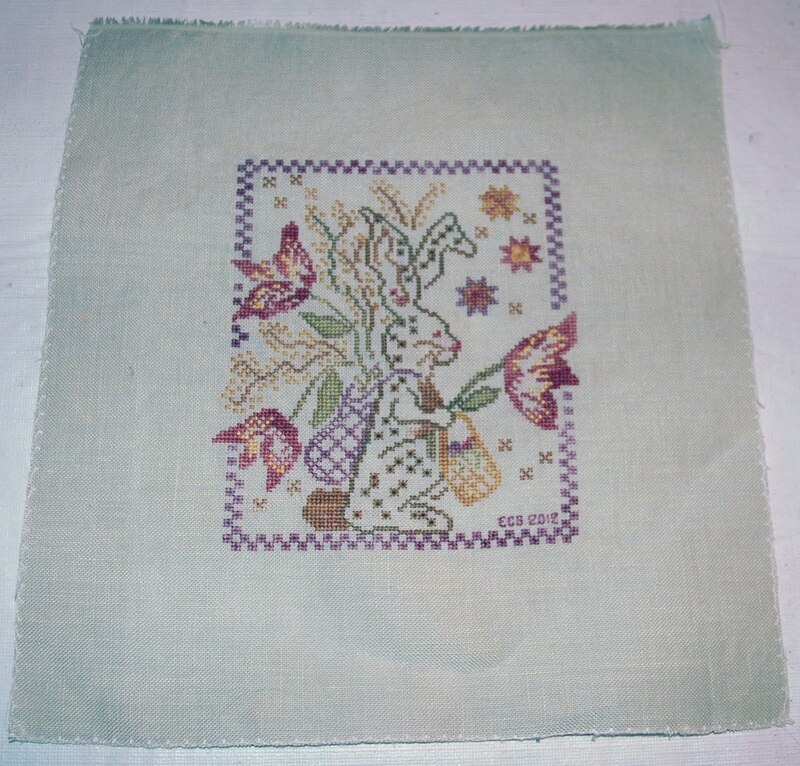 It's a wonderful design and it's somewhere on my to-stitch-pile. I think I have to shift it upwards, lol. Nice progress on the BOAF piece but sorry that you had to frog. Maybe you can be a bit tricky so that the lines meet anyway. BTW, I do love that hair colour, it looks just gorgeous.